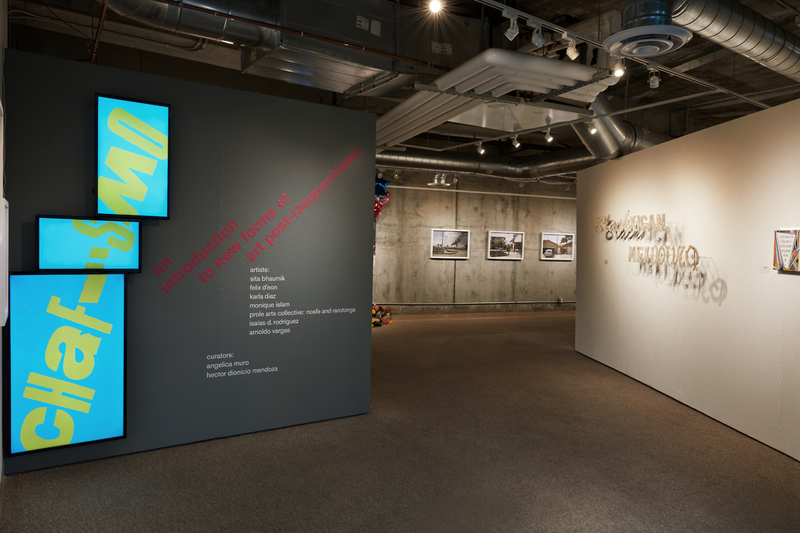 This exhibition re-examines social based-phantom culture by sampling and appropriating sources linked to both high and low culture through the use of materials that convey socio-economic and political factors including class, race, gender, and sexuality. 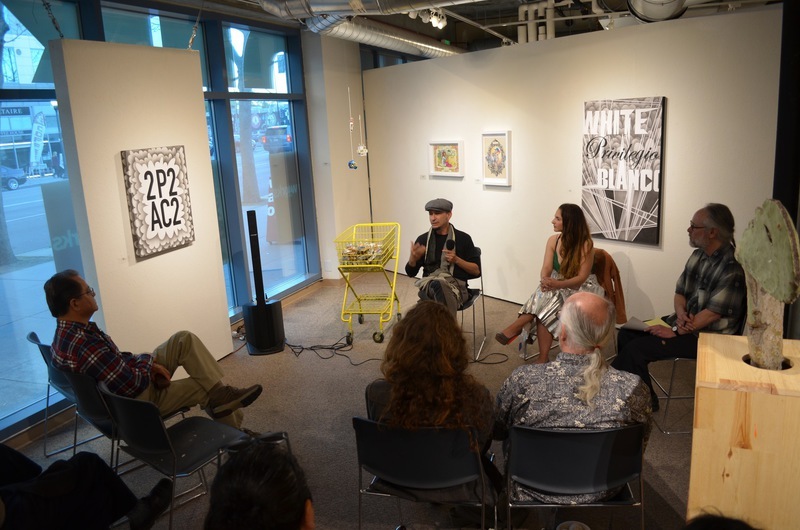 Chafismo highlights work that expands the current dialogue surrounding the complexity within Chicanx art practices. 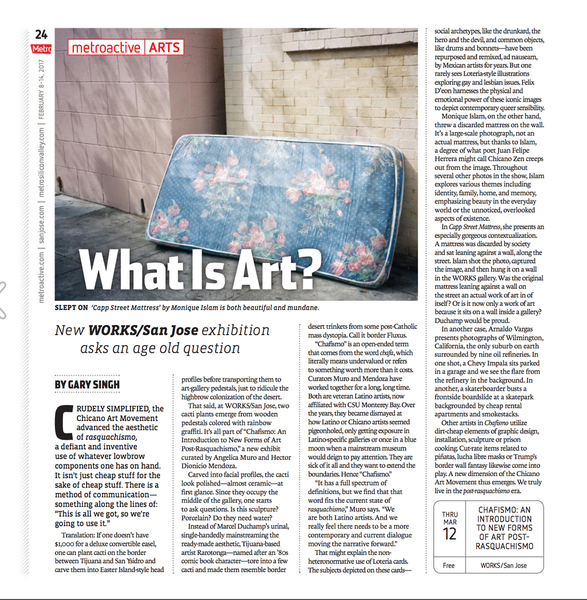 This often means artists giving a critical voice to theoretical paradigms that frame arte y cultura as issues that should be expanding our understanding of positionality, value, and worth. 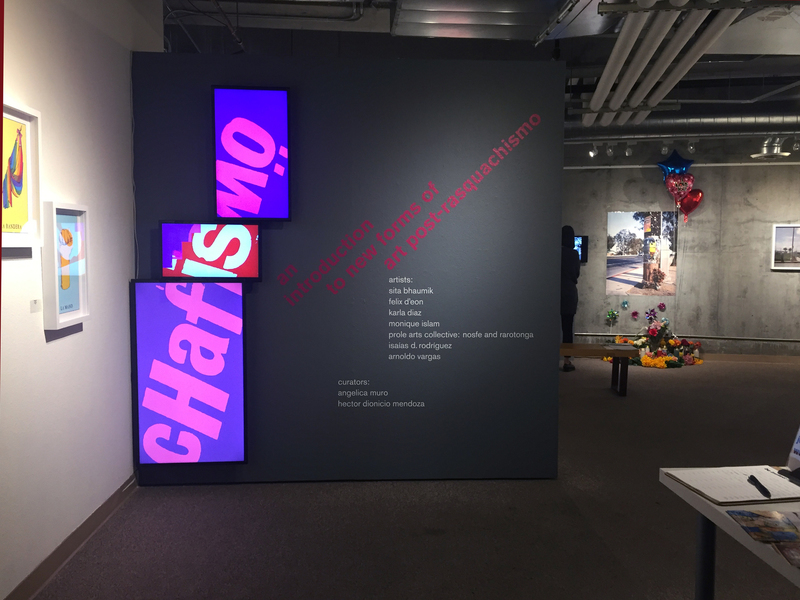 Chafismo, a new approach and visual language, questions established tenets by probing the conventionality of what is considered broken, irreverent, or complacent. Chafismo is an open-ended term that comes from the word chafa, which literally means cheap or worth more than it costs. 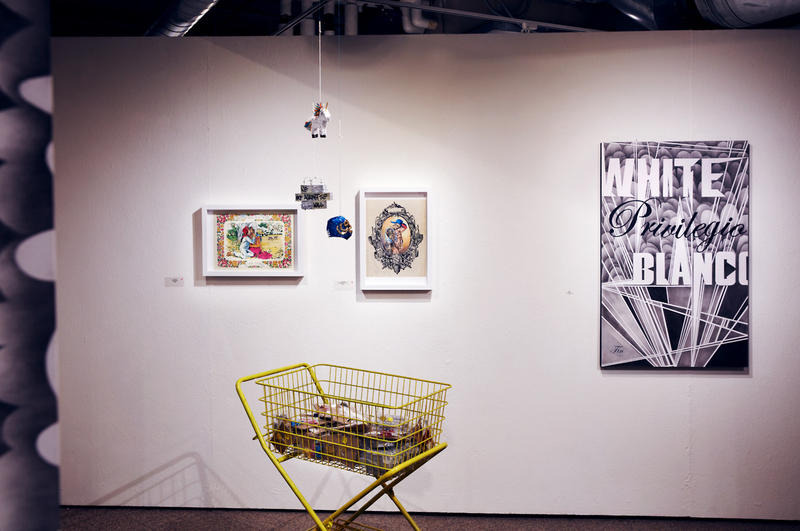 Chafismo is an extension of Rasquachismo—an artform associated with the Chicano Art Movement, which made the most from the least, and was both defiant and inventive—its aesthetic expression comes from discards, fragments, and even recycled everyday materials. 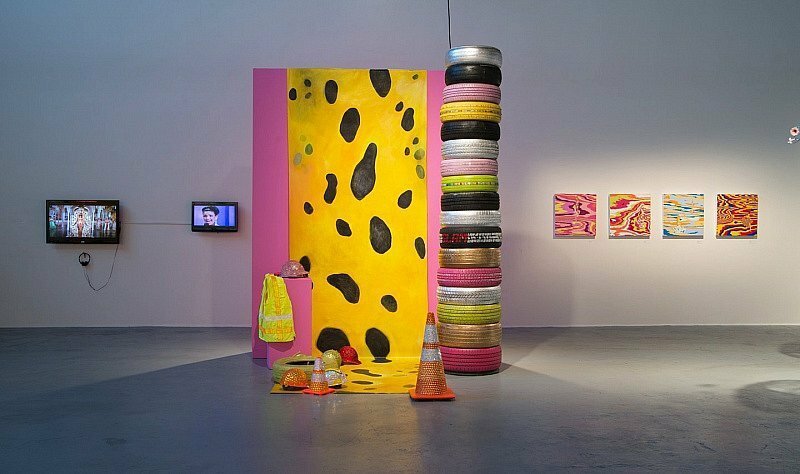 In Chafismo, the same applies, but new conceptual frameworks have moved us towards a new art term that emphasizes Chicano artist practices as disregarded. 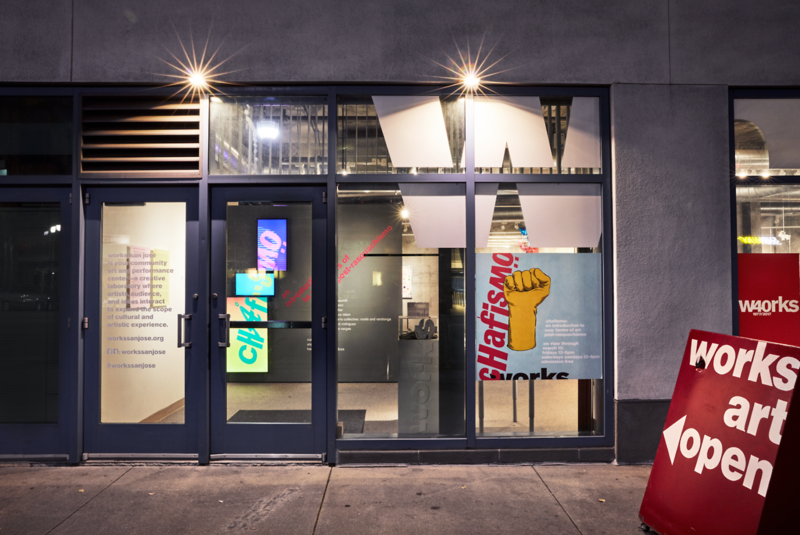 Chafismo embaces the cultural iconography that is fundamentally rooted in an oppressed and marginalized identity by questioning the validity of the movement of Latin-American art and culture that needs to apply a more fluid and globalized cultural identity. 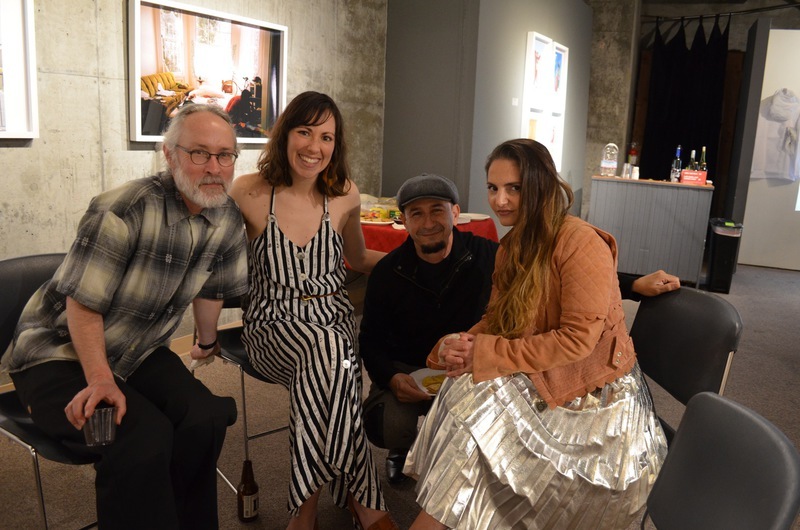 This exhibition features works by Sita Bhaumik, Felix D’eon, Karla Diaz, Monique Islam, Prole Arts Collective (Nosfe and Rarotonga), Isaías D. Rodríguez, and Arnoldo Vargas. 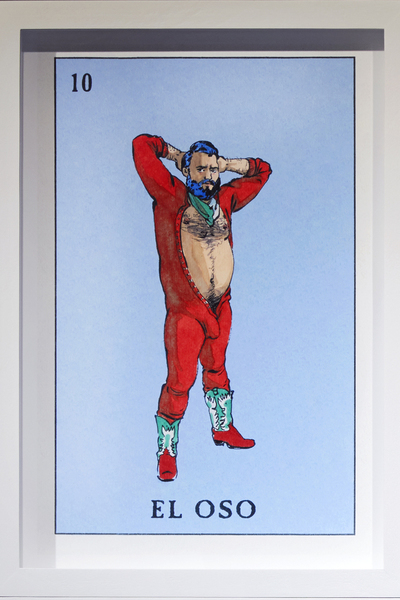 As a gay, Mexican-American man, Felix D’eon has a particular affinity for Latino subjects that represent his own queer community and other marginalized groups. The Mexican game of “Lotería” is familiar to all Mexican and Chicano households. 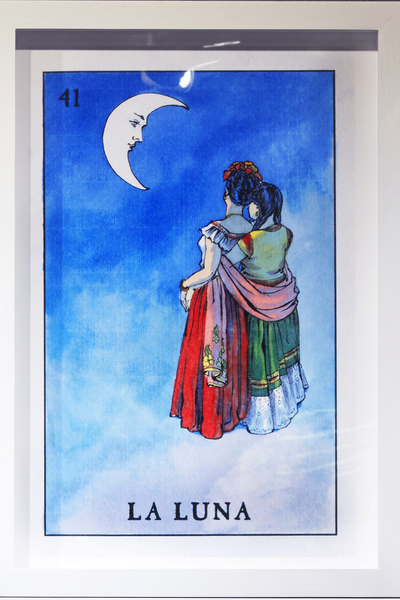 The original Lotería images have an iconic power, like cards in a tarot deck. However, like all such works of vintage popular art, they are heteronormative, and have a racist ideology at their core. 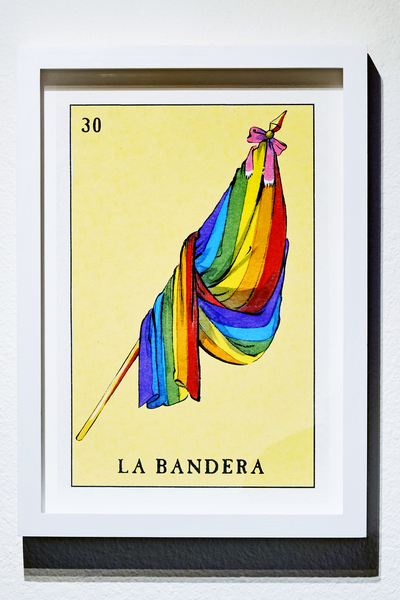 In D’eon’s Loteria series, he has taken the aesthetic, visual, and emotional power of the original deck, and harnessed it into a contemporary, queer sensibility, thereby expanding the meaning of the Lotería, and giving it to an audience previously excluded from it. Muxe Ne Nadxii, portrays a young man and his Muxe lover. Among the Zapotecs, an indigenous tribe from the Isthmus of Tehuantepec in Southern Mexico there exists three genders; men, women, and Muxes. A Muxe is usually biologically male, but because he does not identify as male, he is assigned the third gender– usually at a very young age. Muxes usually wear female garb, and take on female-gendered tasks, such as embroidery or selling in the market. In Mi Cholito Hasta la Muerte, we see a contemporary couple in a loving embrace. Through various signifiers, such as tattoos, red and blue headgear, and wife beater undershirt, D’eon speaks to hip hop culture, rival sensibilities, and hyper masculinity. 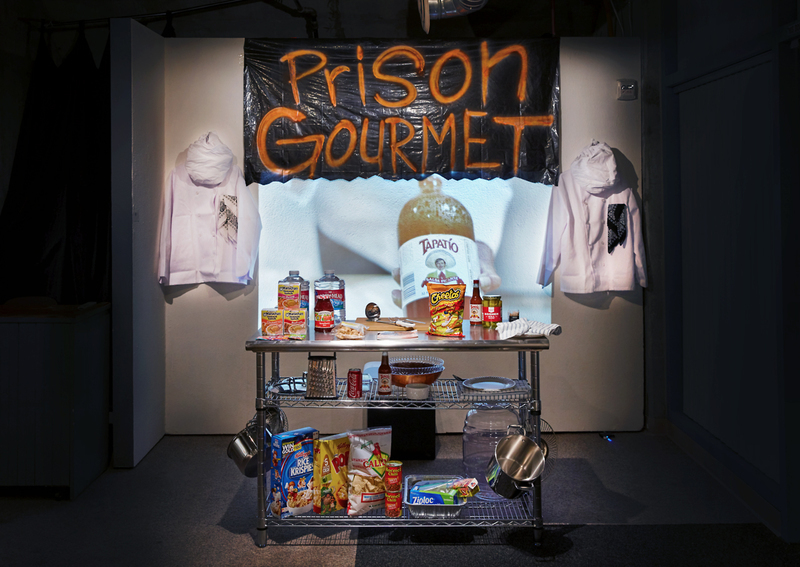 Karla Diaz’s Prison Gourmet is a multi-media installation that includes performance, video, and a book that features prison commissary food recipes. 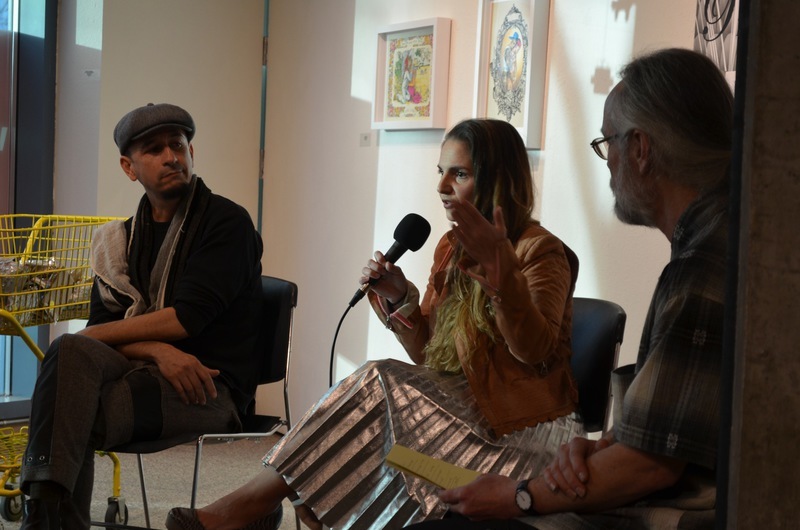 The piece was originally conceived as a two-hour performance for the Los Angeles County Museum of Art (LACMA), and inspired by Diaz’s brother who was in prison. 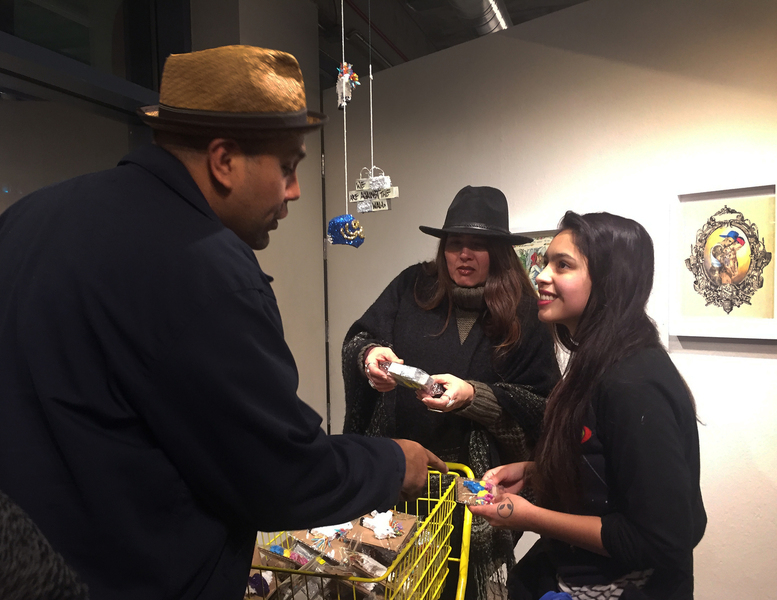 Thru Prison Gourmet, Diaz is interested in exploring food politics, and issues that relate to prison food such as memory, freedom, race, culture, and survival. 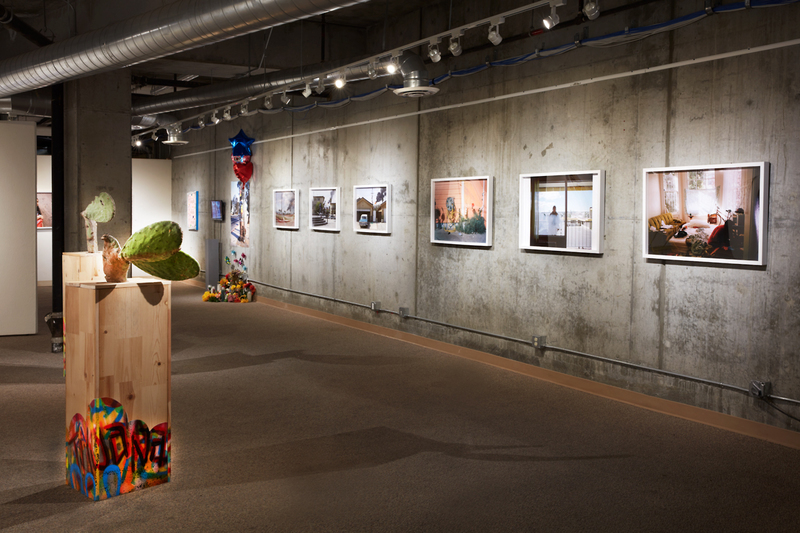 Monique Islam explores various themes including identity, family, home, and memory. 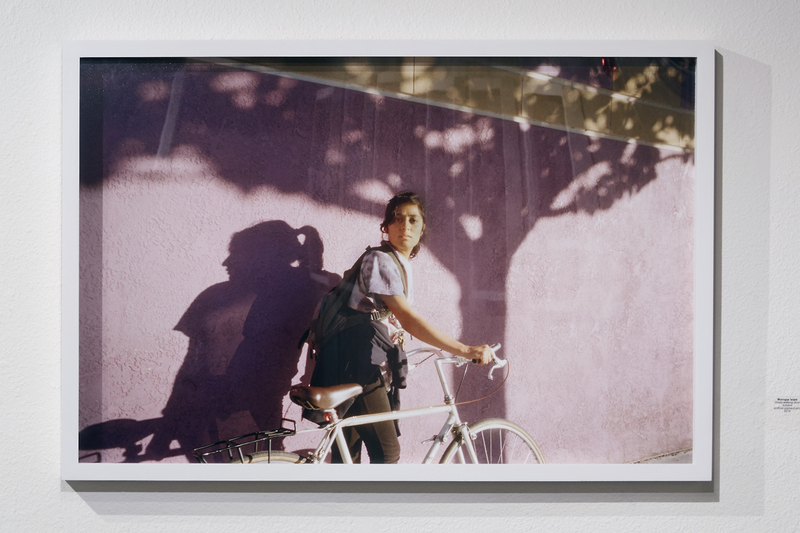 In her series, Mujeres (Women), the artist reflects on her self-worth as a mujer de color (woman of color) by photographing women in her life in a pointed manner that suggest confidence and independence through an honest and intimate approach. Momentos Divinos are about the physical preservation of memory through daily explorations and interactions with people and everyday objects. Islam’s eye gravitates toward small moments in time, which would otherwise go unnoticed and eventually forgotten. Nosfe X is a “Sociologo Cultural” (Cultural Sociologist) who uses his artistic practice as a conduit to agitate and encourage dialog on topics of race, politics and identity. Nosfe is a member of PAZ (Prole Arts Zindicate), a recently founded artist collective. 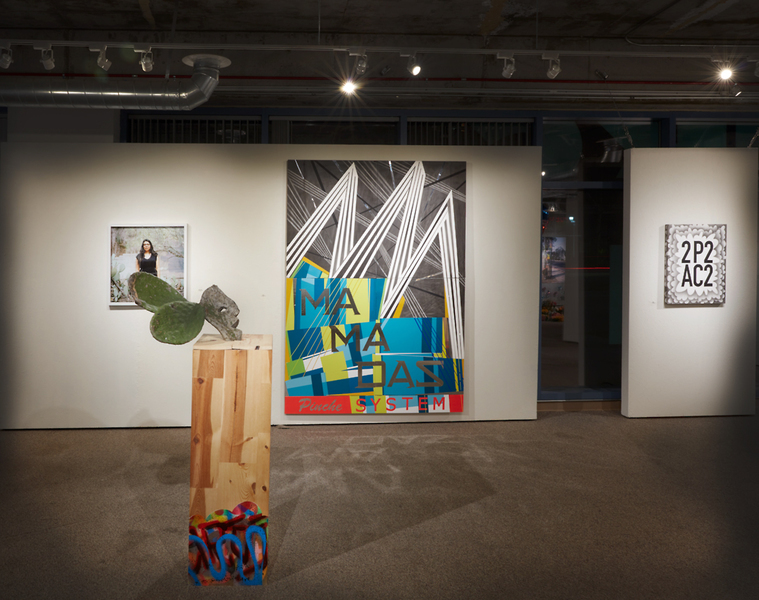 PAZ’s main goals are to encourage and promote social justice as well as create and foster creative outlets in the form of group exhibition and professional-practice workshops aimed to mentor under-represented artists. 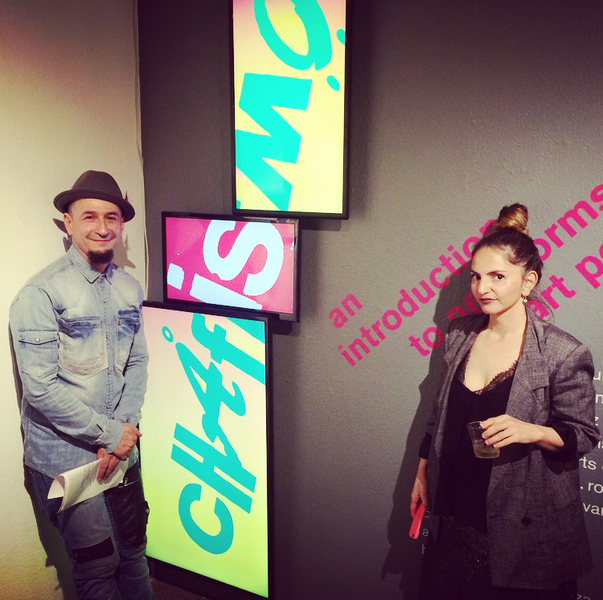 Nosfe X’s text-based artworks utilize a quotidian lexicon. For example, 2P2AC2 is only effective if read in Spanish, and references our short-hand, texting-based language as a coded dialect that is meant to be vulgar, and specific to a proletariat class that is subjected to systematic oppression, inequality, and an imposed social identity. RAROTONGA, also from Tijuana, Mexico, appropriated her name from a mighty, powerful, strong comic book character from the 1980’s. She originates from Guadalajara Mexico, and is the daughter of a Mexican father and a Filipino mother. 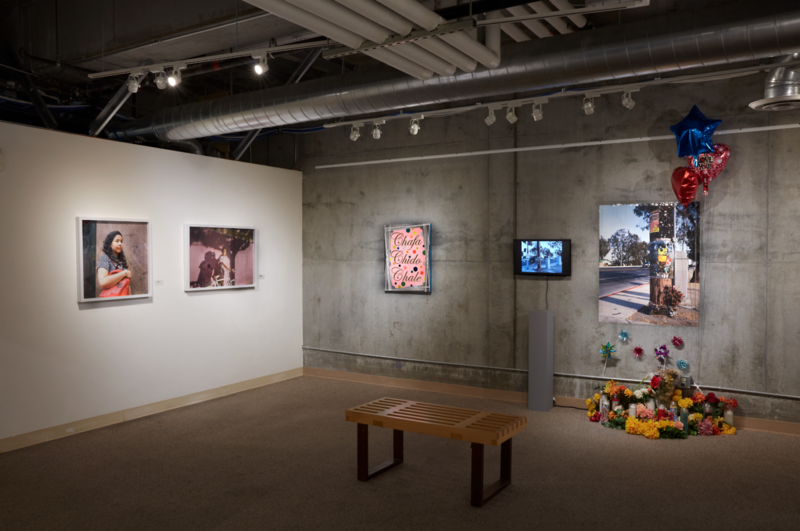 Rarotonga’s work explores the fluidity and intersectionality of identity, race, social class, and gender. Her art practicum includes mixed-media sculpture and video. 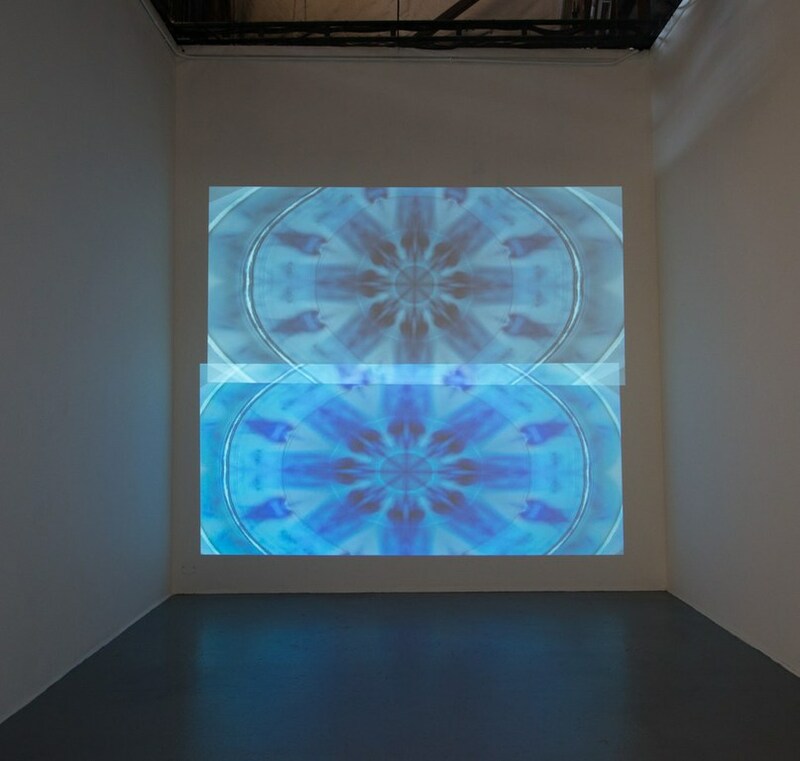 Her installation titled Couple references an inter-racial relationship. The text in this work reads Blackxican (Black and Mexican) and Mexipino (Mexican and Filipino). The letters are made of wood with a tortilla coating that references domesticity and cross-cultural food staples. In Witness, RAROTONGA planted a cacti boarder between Tijuana and San Isidro, Ca. This action included the carving of faces on the cacti as an act of reclamation about land, territory, witness, and allegory. 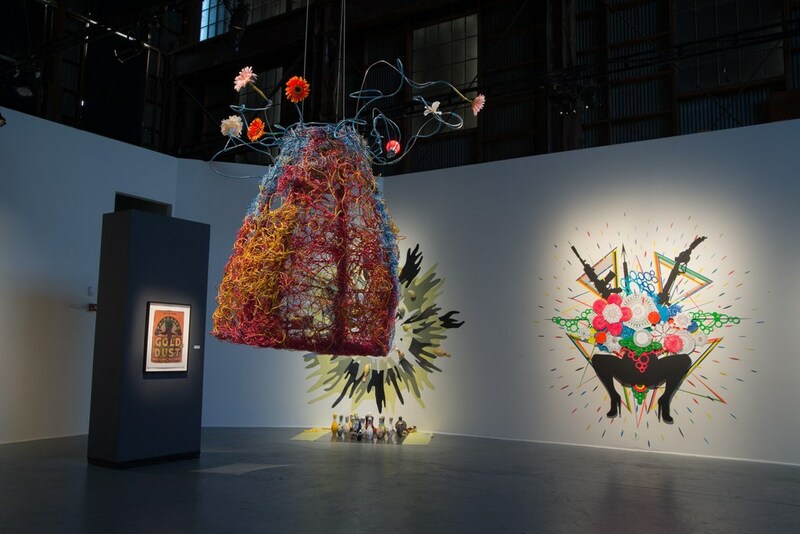 The work of Isaías Rodriguez and Sita Bhaumik includes the traditional materials used to fabricate piñatas (ephemeral sculptures that are intended for ritual celebration, special occasions, and that end in a ceremony of destruction). Rodriguez’s Piñata Cart contains scaled-down versions of luchador mascaras (wrestling masks), unicorns, and burros (donkeys). This commonly used iconography conjures childhood memory. The little piñatas displayed here are fetishized, and become keepsakes that take on permanence and value of one’s cultural identity. Similarly, Trump Wall is small scale maquette that uses piñata materials to reference obliteration in relation to Donald Trump’s proposed building of an “impenetrable” border wall between the U.S. and Mexico. The proposed height of this wall is up to 65 feet tall. This scale model represents a 55-foot wall in relation to the U.S. president’s 6’2” height. 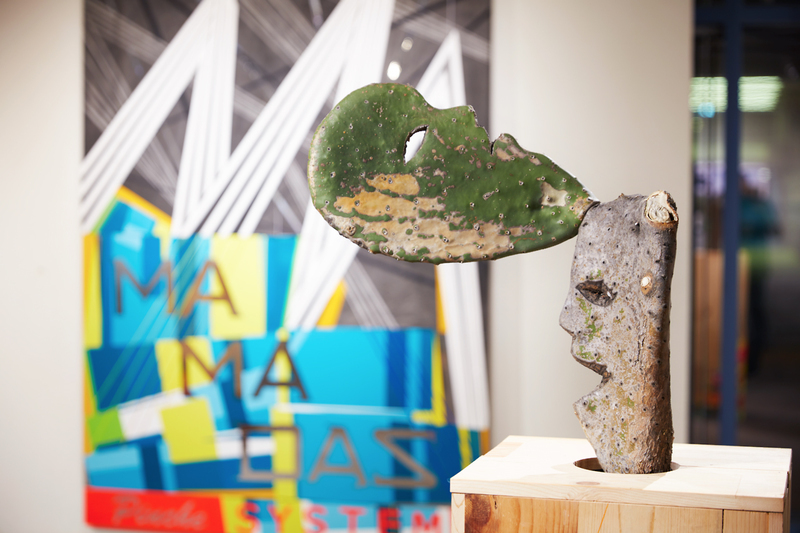 The work of Arnoldo Vargas features nine years of examination surrounding subversive applications of freedom evident through the creation of street side memorials. 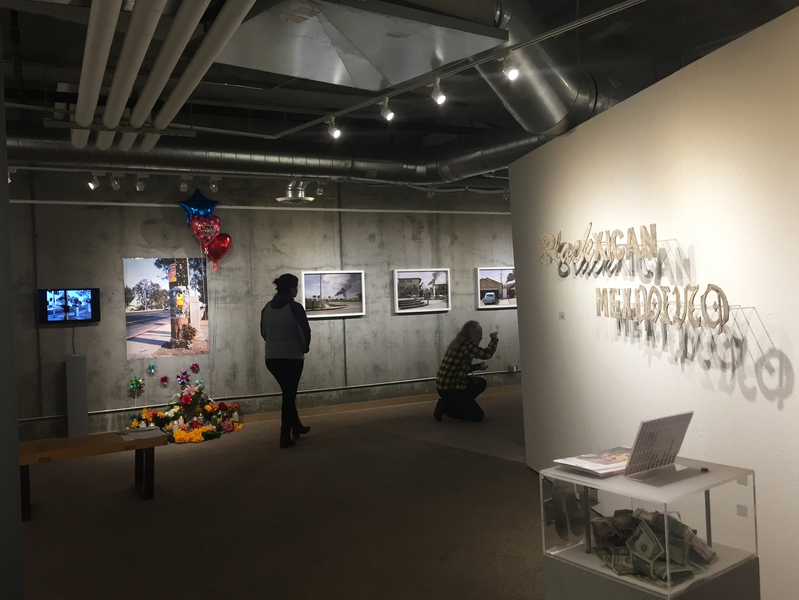 In Memoriam II is an ongoing site specific project that predates the black lives matter movement. 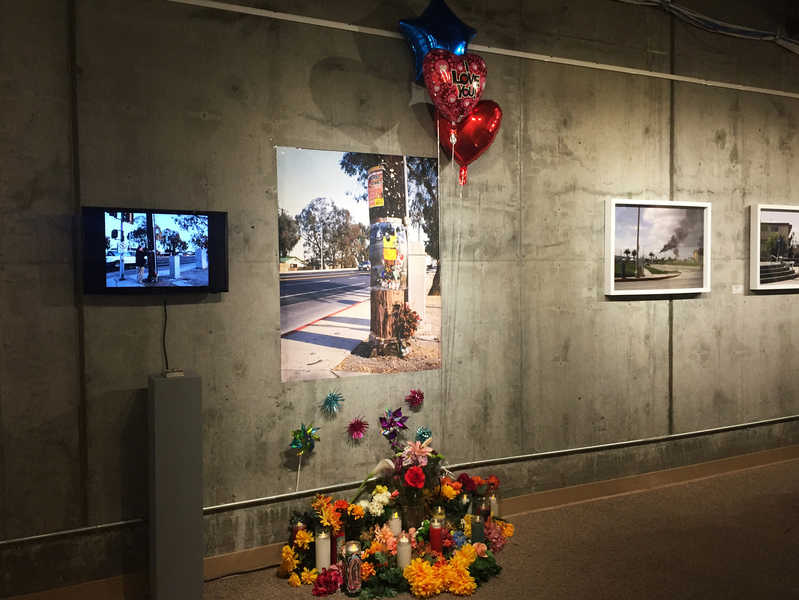 Vargas purposely considered two memorial sites that were created in response to fatalities resulting from officer involved shootings in his community of Wilmington, California. 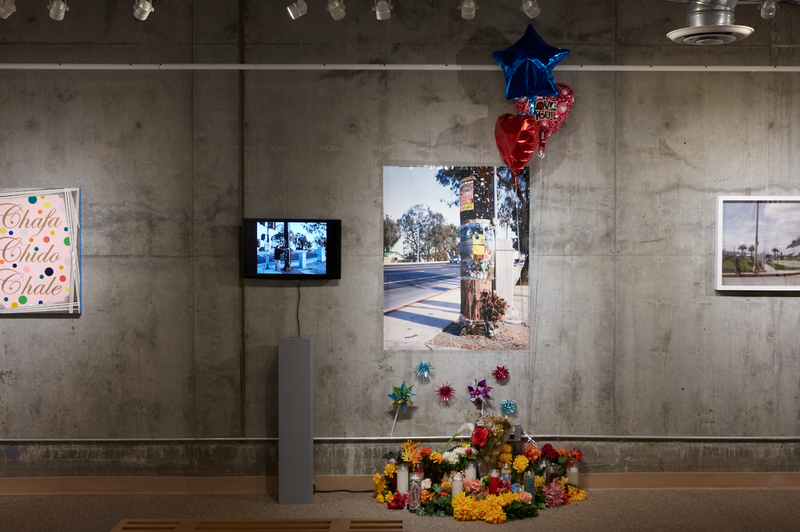 This relational installation is comprised of site-specific photography, video, and performance in honor of two male community members that were fatally shot within a three-week span and five blocks from each other. 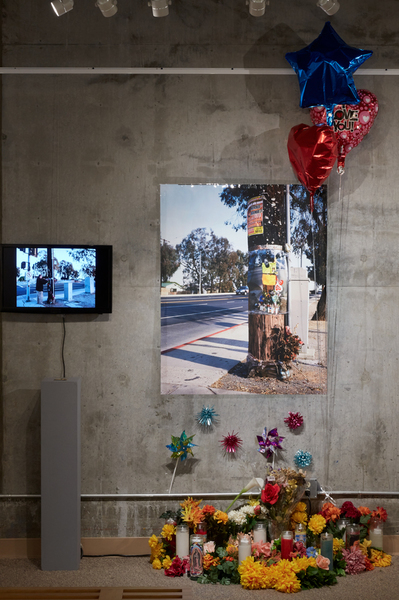 This installation considers perception, persecution, and a city sanctioned gang injunction through the use of cartography–allowing ideas to be expressed and visualized through a rhizomatic mapping process. The underground sprout of a rhizome does not have a traditional root. There is a stem there, the oldest part of which dies off while simultaneously rejuvenating itself at the tip. The new relations generated via rhizomatic connections are not copies, but each and every time a new map. In Memoriam II and Officer involved Shooting are figuratively and literally rooted in our impulse to archive, collect and accumulate information that absorbs a time, a place, and a memorial. 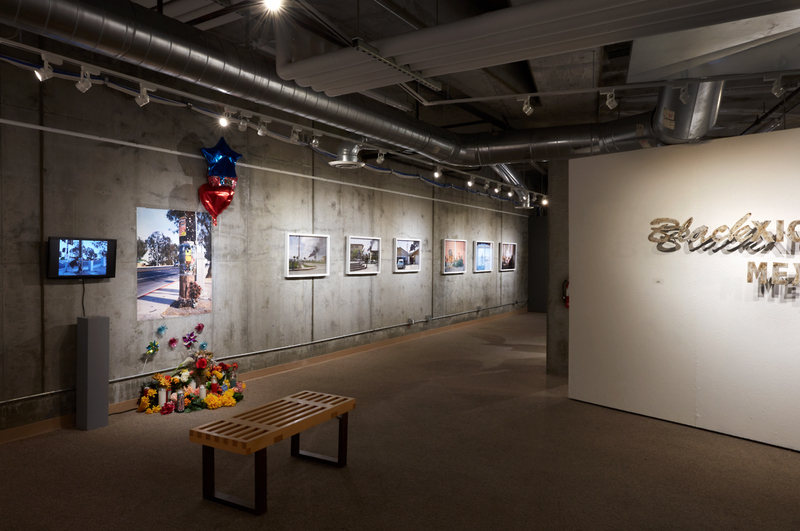 Vargas’ With Flare series poetically depicts the contrast between community and industry as it co-exists in Wilmington, Ca. Wilmington is the only city in the world that is surrounded by 5 major oil refineries. 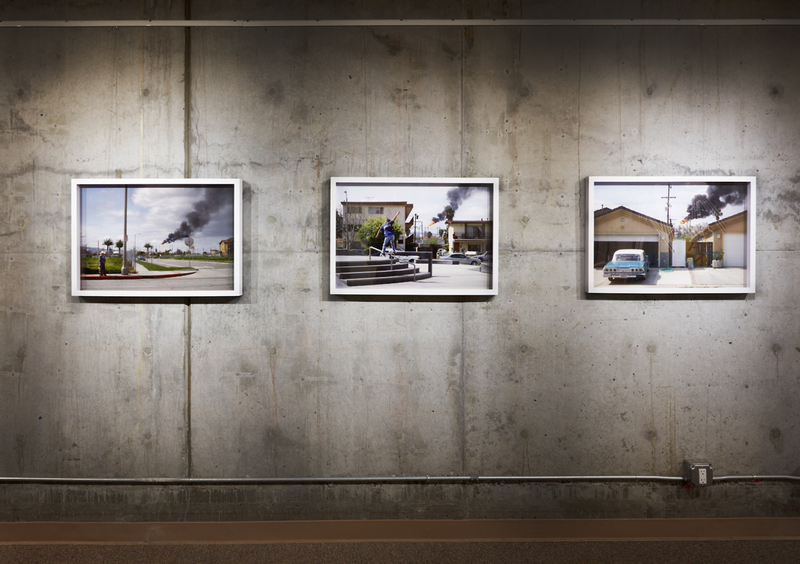 Each photograph depicts the flare of the oil refineries as an ecosystem of the neighboring community. Flares are a byproduct of oil production, and occur when the plant malfunctions. 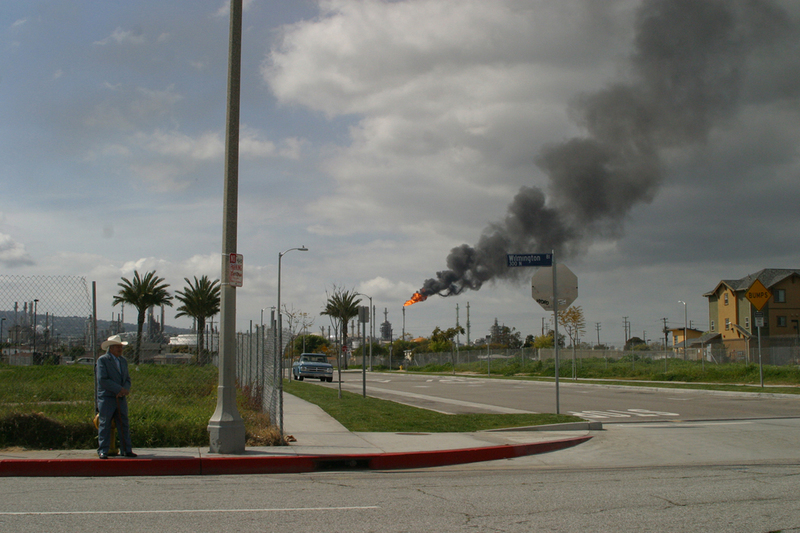 Although illegal and punishable through minimal fines, the flaring and its toxic effects are hazards that the community endures through a strange symbiotic existence. Caprichos Anatomicos is about retaining the values inherent within a medium while staying true to the diversity of options that allow for risk-taking. The artists in this exhibition see abstraction as experimental–referential, fragmented, and often complicated by the responsibilities inherent within methods and materials. Abstraction is rooted in reduction and reinterpretation. The irony is that the reductive and experimental qualities of the medium complicate things, and the process is often what’s intriguing for the artists. Caprichos Anatomicos (Anatomical Caprice) references obsession through sudden unaccountable changes in mood or behavior. Through abstraction, the artist is dissecting and analyzing by emphasizing one obsession–a word, an image, a gesture. The abstraction becomes the complexity and the system, and by erasing what we don’t need, we find what we want. 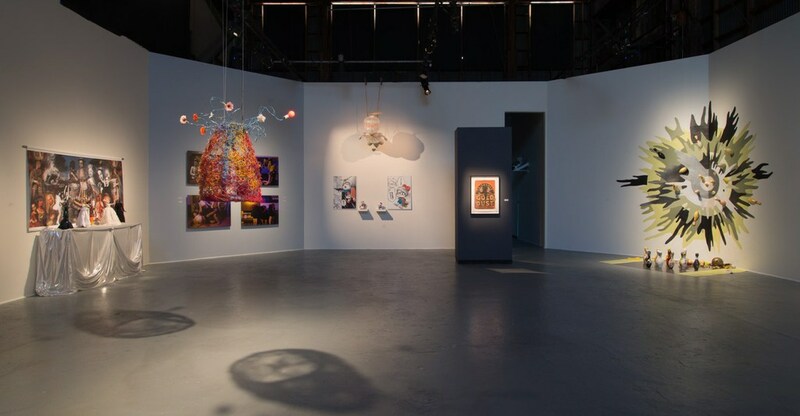 Caprichos Anatomicos features work by Facundo Argañaraz, Miguel Arzabe, Sofía Córdova, Juan Luna-Avin, Angelica Muro, and Rodrigo Ojeda-Beck. Facundo Argañaraz’s recent body of work includes paintings, sculptures, and works on paper. His process consists of exploiting a wide range of mark making tools (silkscreens, transfers, spray paint, roller pads, etc), ready-made forms, and found imagery, such as cultural debris and waste, in order to arrive to and organize the resulting visual fields into abstract, constructed compositions. Argañaraz’s practice is aimed at confronting and living within the conditions of contemporary aesthetics, which are locked into an ever expanding present. Passenger 1-2 lays bare the entropic characteristics of modern constructs, and the erosion of content through time. Accordingly, he attempts to mine what is left—the surplus of fossil forms—in order to keep (in these times) acting upon the impossibility of creating new reciprocal art forms, and the equally persistent impossibility of not. Miguel Arzabe’s sensibilities draw from diverse sources––ranging from Modernist painting and conceptual art to indigenous crafts such as weaving and storytelling, which resist rigid boundaries and literal translations. 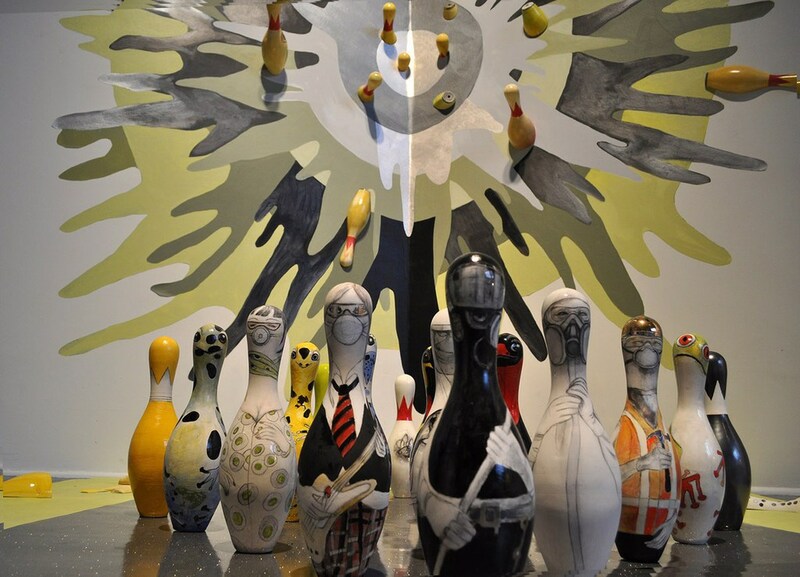 His work encompasses multiple modes and media. Whether through painting, drawing, sculpture, or relational environments, a central concern remains—that which is pointing towards a fleeting moment or action within space. His paintings and weavings investigate the existing landscape of a medium while looking for space in which poetic gesture and thoughtful intention combine to reveal truthful contradictions of the human experience. Sofía Córdova makes use of 8mm black and white films of flora and fauna. They Held Dances On The Graves Of Those Who Died In The Terror 1,2,3, 4, +5 is comprised of film projections that are re-filmed digitally to both ‘preserve’ and reinterpret remnant documentation of the natural world we once lived in, which is presumably drastically changed in the future. Córdova’s work is intended as a specimen for a future earth in which flora and fauna no longer exist. 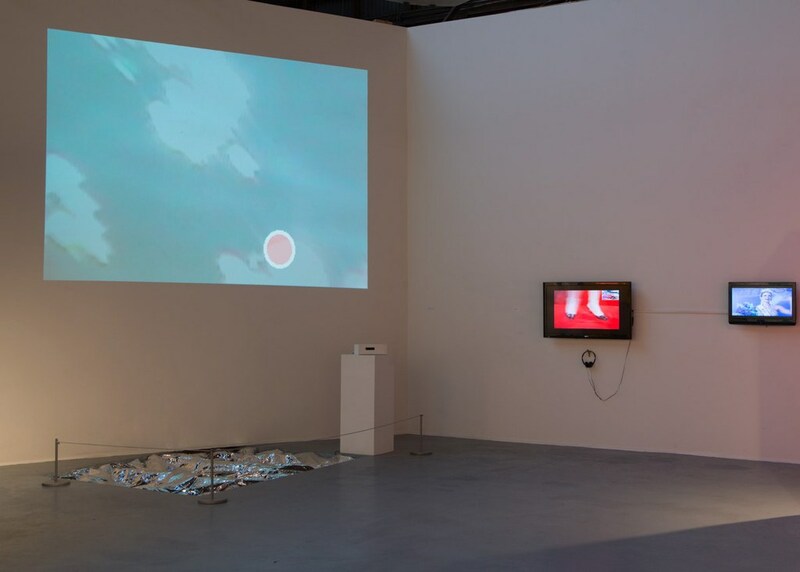 Each channel carries an individual sound piece that collectively forms a composition. The installation presented here is made up of the song Fantasia, a reworking of Mariah Carey’s Fantasy and Tom Tom Club’s Genius of love. This new composition, created in collaboration with Matthew Kirkland, is in Spanish and describes a world where dances are held on concrete slabs under a dying sun and where human survivors are in constant peril—not just from hostile conditions but from each other. Each monitor has its own audio and visual channel, so that over time the videos fall in and out of sync with each other, and the viewing becomes different and new every time. Juan Luna-Avin works across multiple disciplines, from collage to installations, to explore the range of possibilities for his ideas. He’s interested in creating a universe that combines an interest in mythology, contemporary music, history, comic books, memory, low-fi technology, and informal economies. 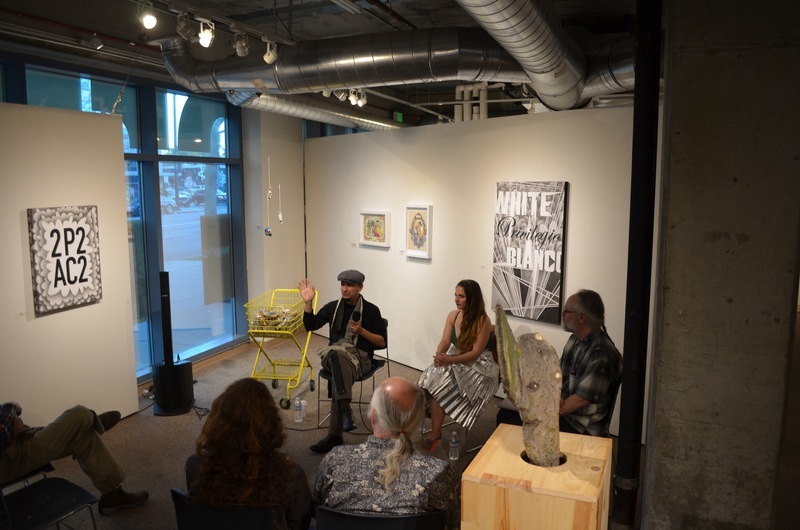 Through research and collecting materials, he often examines specific underground cultural movements that have a large impact on society but were historically dismissed. Luna-Avin’s current body of work is a hybrid of drawing, painting, printmaking, and collage. Part of his research consists of searching for debris, such as dry paint skin, torn paper, old stickers, used mailing labels, and scraps found on the streets. These materials are integrated with mostly abstract and cartoonish imagery inspired by various people and locations. 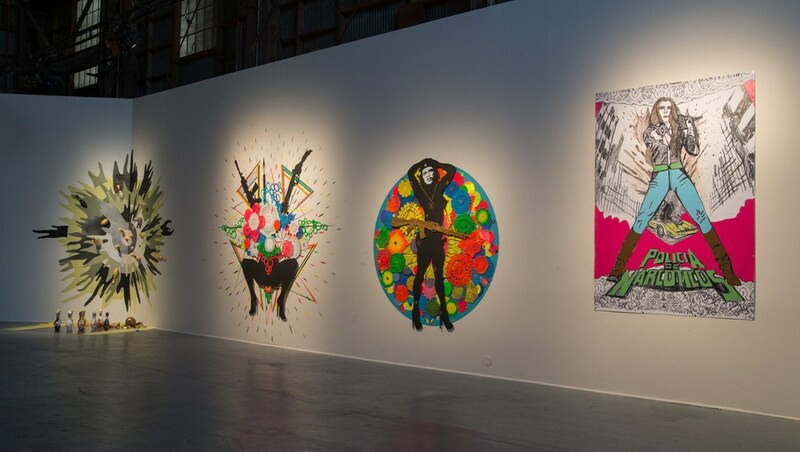 The works presented here reflect influences that range from paintings by Antonio Saura and Jorge de la Vega to the legacy of comic book aesthetics, especially the use of crude drawing techniques and arbitrary compositions. 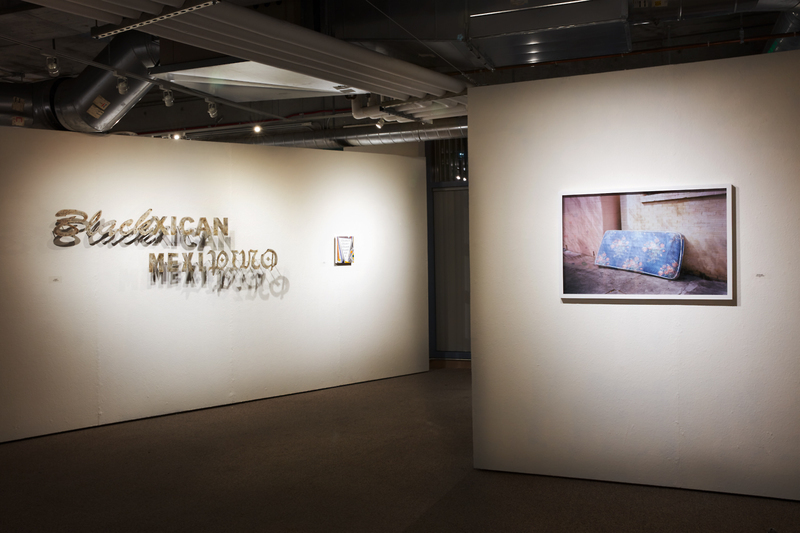 Angelica Muro’s Narco-Language references the proliferation of drug culture in relation to cultural identity, mediated images, and pop-culture. Narco has become a general prefix that is wide spread within Narco-Culture, and has developed into a kind of off-hand jargon that anesthetizes people to escalating violence through repetition. 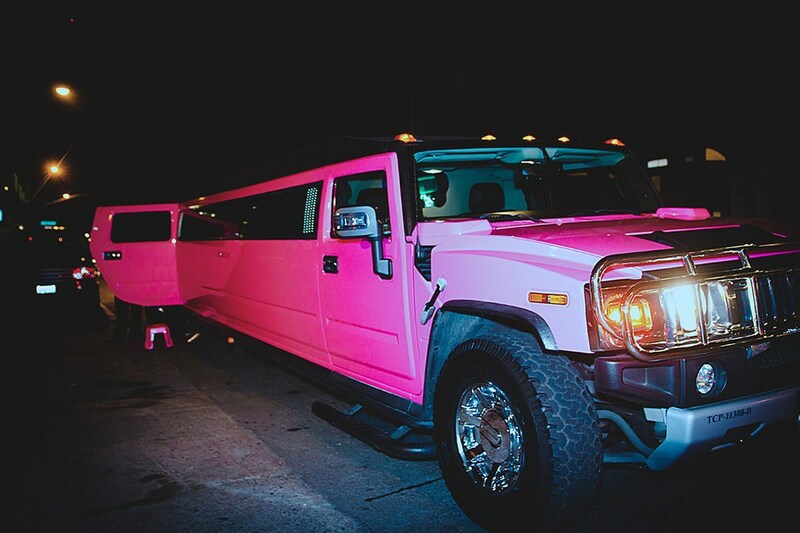 For example, Narco-Fosas are pits where cartels dump victims; Narco-Mantas are the banners strung by gangs from highway overpasses with threatening messages; Narco-Chic refers to a lifestyle of AK-47 rifles, flashy cars, and status symbols, such as ostrich-leather boots, rhinestones and gold pendants; Narco-Queens are beauty pageant contestants who become involved with drug lords, and more specifically, Sinaloense beauty queens who are drawn into the Sinaloa drug trade. A fascination with both Narco-Queens and Narco-Wives has led to the creation of Narco-Novelas, which are stories of lavish lifestyles, drugs, money, status, and power. 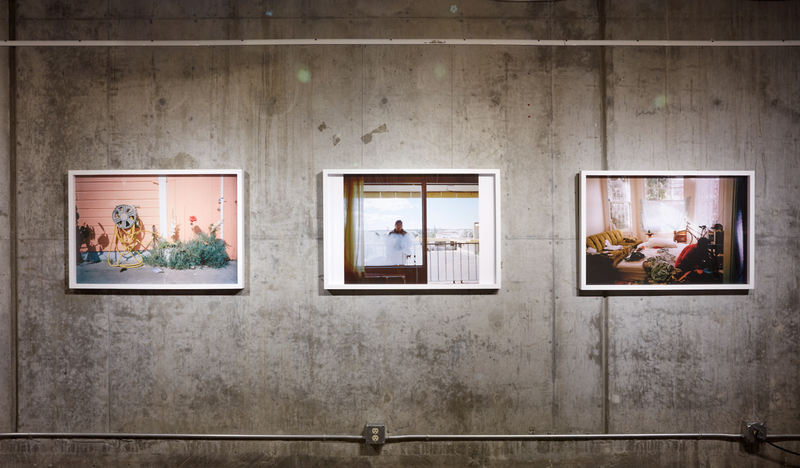 The photographs shown here are part of a larger series that present the term Narco as untidily scattered, sprinkled, spread, and tossed through everyday speech— eluding and amplifying the language and visual culture of drug cartels and drug violence, which has become so normalized that we often read these images as both glamorous and gruesome. Rodrigo Ojeda-Beck’s Lost Film is a visual representation of the fleeting nature of memory, and our ability to visualize and reminisce about the past. Lost Filmwas inspired by Ojeda-Beck’s long-time friend, Joby, who would frequently tell him about a roll of Super-8 film that she had shot in her adolescence. This footage only captured moments that she found to be beautiful, and weeks and months would pass between shots, so it took her years to shoot out the entire roll of film. Joby never developed the roll, and swears that it is still in the camera. Every time Joby referenced the footage, Ojeda-Beck would urge her to track it down. However, with the passage of time, he also observed that every time she remembered the film, she was also coming to terms with the loss of it. Ojeda-Beck began asking her to write down short descriptions of the footage that she remembered shooting. The texts in Lost Film are her memories of roughly 14 shots. 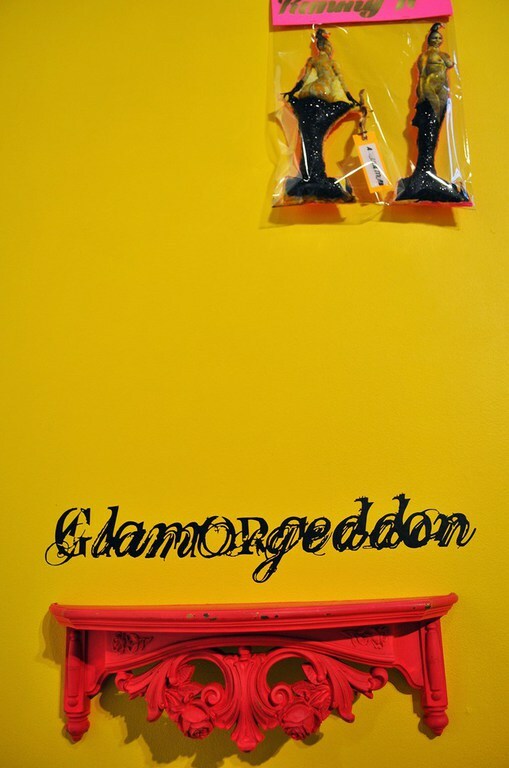 Glamorgeddon is the first of three SOMArts Commons Curatorial Residency exhibitions in 2015, and builds upon the builds upon the elusive concept of glamour in relation to camp, kitsch and abjection as instigated by artists such as filmmaker and photographer John Waters and Debora Iyall of Romeo Void when Poethig mountedthe group exhibition The Glamour Summit at SOMArts in 2000. 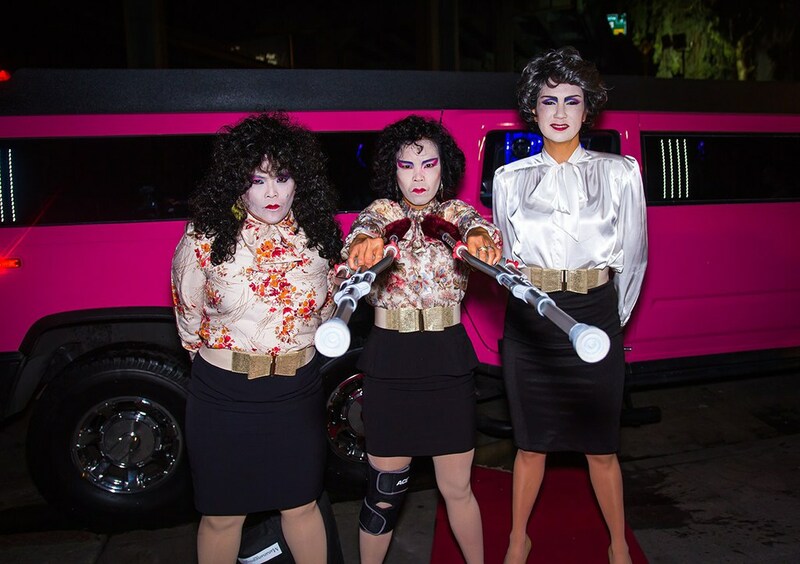 Two high-energy “spectacles” activate the visual artwork in Glamorgeddon with performance and provide interactive experiences for the audience— both in the gallery and inside a roving hot pink limousine. 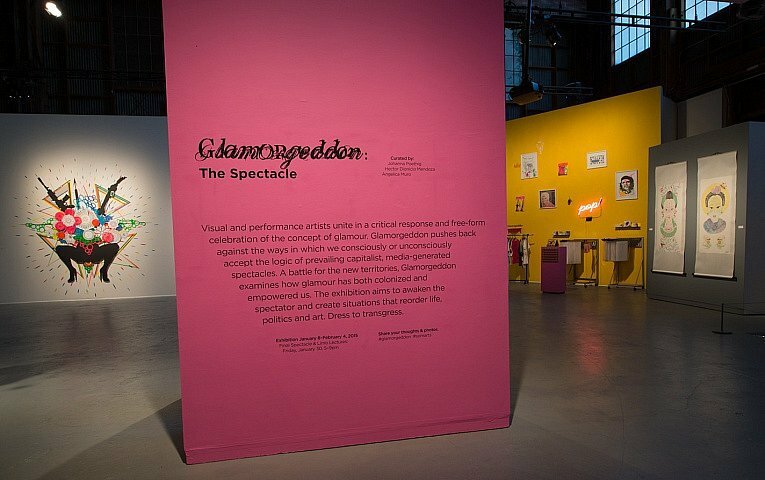 Glamorgeddon’s Opening Night Spectacle will take place on Thursday, January 8, 6pm to 9pm, free admission. 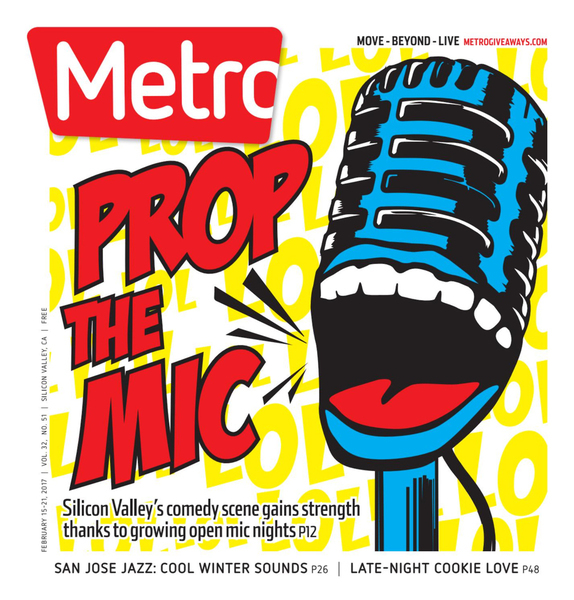 This visual art opening features live music and over-the-top performances, as well as a POP! shop with limited-edition, artist-created swag. For performance descriptions and performer biographies, click here. The Glamorgeddon Final Spectacle on Friday, January 30, 5pm to 9pm, features free admission to performances in the gallery from 7pm to 8:30pm that include a new work by sound artist Laetitia Sonami, WIGband, a legendary, tasteless, feminist performance art cabaret duo created by Poethig and Barbara Golden in 1985, and Queen Crescent, a heavy psychedelic flute rock band. For a detailed schedule of the evening, please click here. 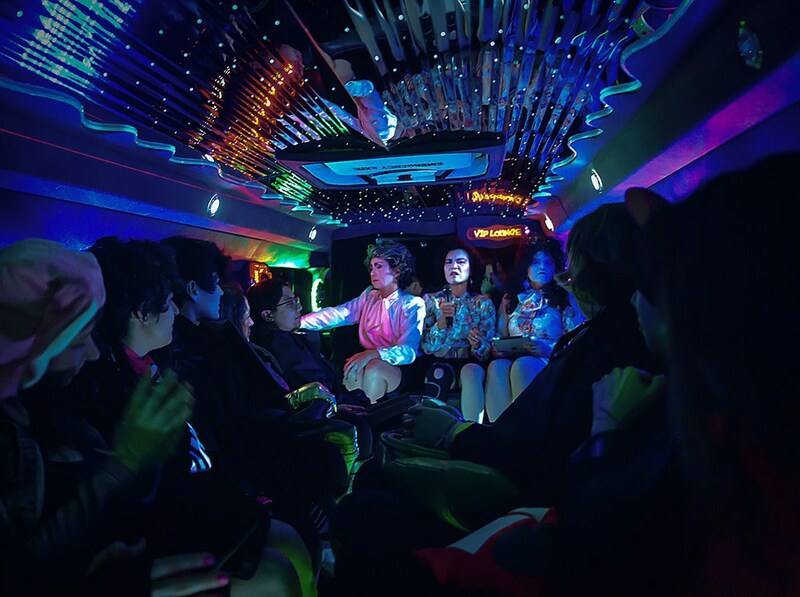 On the same evening, from 5pm to 9pm, audiences can circle the city of San Francisco in a garish pink limousine while enjoying one or more of an array of ticketed 30-minute performative Limo Lectures facilitated by scholars, performers and activists. 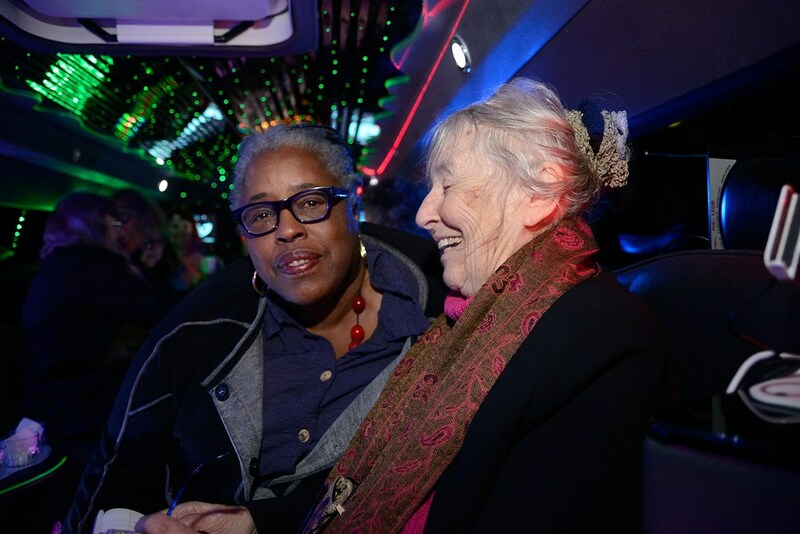 The immersive experience on wheels departs from SOMArts, costs $20 per lecture and includes complimentary beverages. Advance tickets are recommended. For detailed descriptions of the lectures and ticket information, please click here. 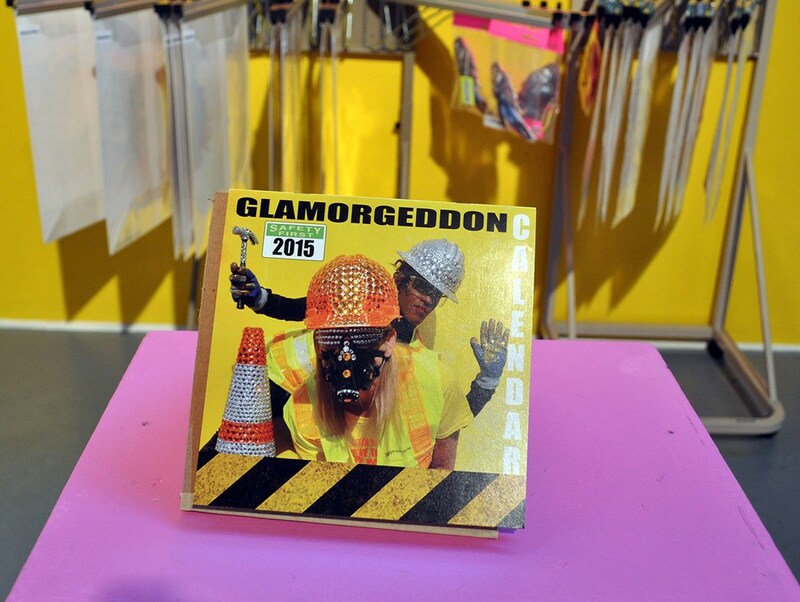 Visual and sound elements set the stage in the gallery for the Glamorgeddon–– Poethig has bedazzled construction hardhats, tools, a traffic cone and a stack of tires with rhinestones. 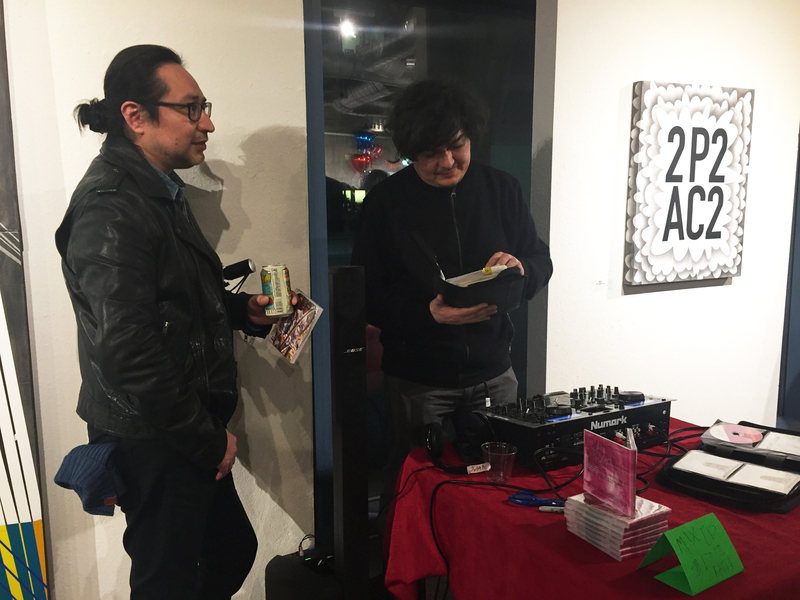 Chris Brown and Chris Kubick provide a sound environment for the exhibition that consists of disco music and cheers. Amalia Mesa-Bains and Joyce Hsu offer figurative work in the form of dolls. 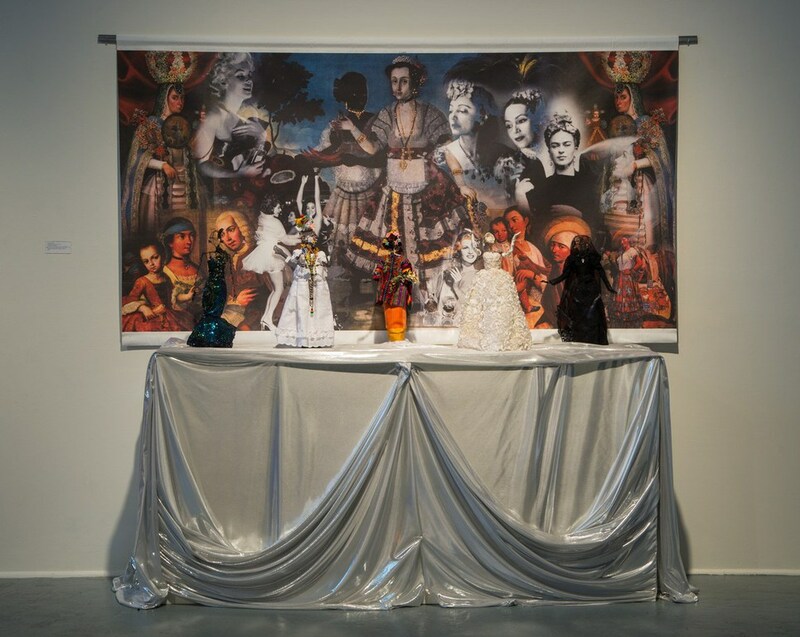 Mesa-Bains’ “El Fin del Siglo, Latina World’s Fair (2000)” invoked scientific racism and representations of women in nineteenth-century world’s fairs. 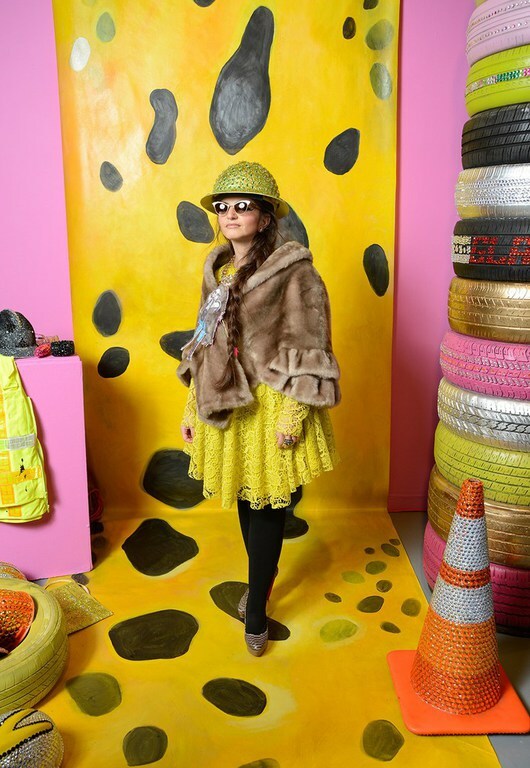 Mesa-Bains builds on the World’s Fair tradition of exhibiting miniature fashions, but in her versions, the looks are donned by iconic Latinas including Frida Kahlo, Celia Cruz, Margarita Cansino (Rita Hayworth), Patssi Valdez and others. 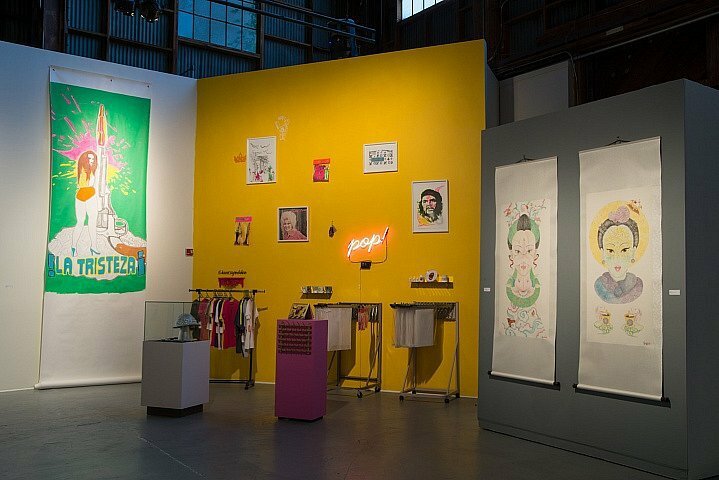 A backdrop includes a history of Latina glamour girls. Dolls by Joyce Hsu playfully re-invent icons familiar in contemporary culture, such as “Hello Kitty” and “Gundam.” These sculptures, inspired by “supercute” Japanese characters and vinyl toy figures, are designed to circumvent gender norms and were crafted through cutting-edge 3D printing and mass production techniques. Stella Lai exhibits two paintings that portray female goddesses in Chinese culture, considering the impact and relevancy that these historic heroines have had on modern society. Mildred Howard reimagines historic packaging of Fairbank’s Gold Dust Washing Powder, an early 20th-century cleaning product, in the 30” x 40” digital print, “The Other Side of the Coin (2014).” In place of the gold coins that decorated the original Gold Dust box, Howard has inserted Booker T. Washington memorial half dollars and Sacagawea golden dollar coins. Likewise, in place of the racist caricatures of Dusty and Goldie– the “Gold Dust Twins” that graced packages and ads for Gold Dust products as early as 1892– the artist herself appears in a grisaille (depicted in tones of gray) self-portrait, her back turned as if in defiance, proudly displaying her dreadlocks. 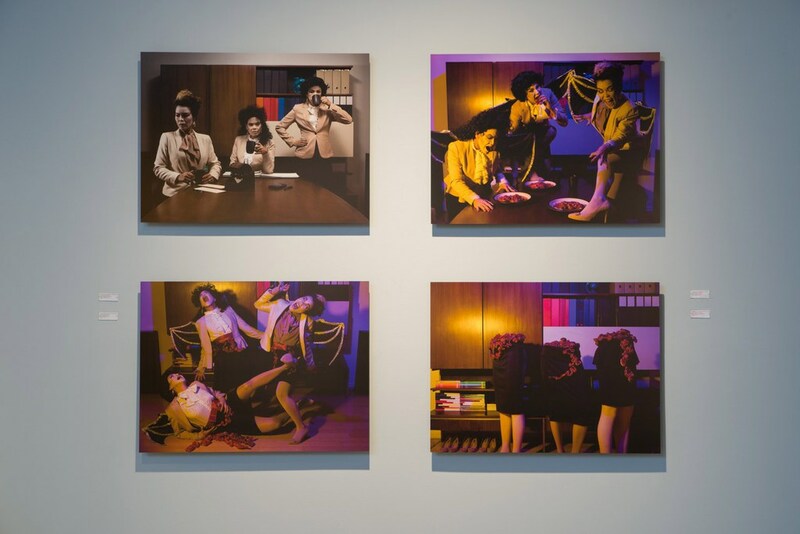 Angelica Muro’s “Policía de Narcóticos,” inspired by female representations in Mexican cinema, references the female action heroine as an attractive, self-empowered femme fatale. 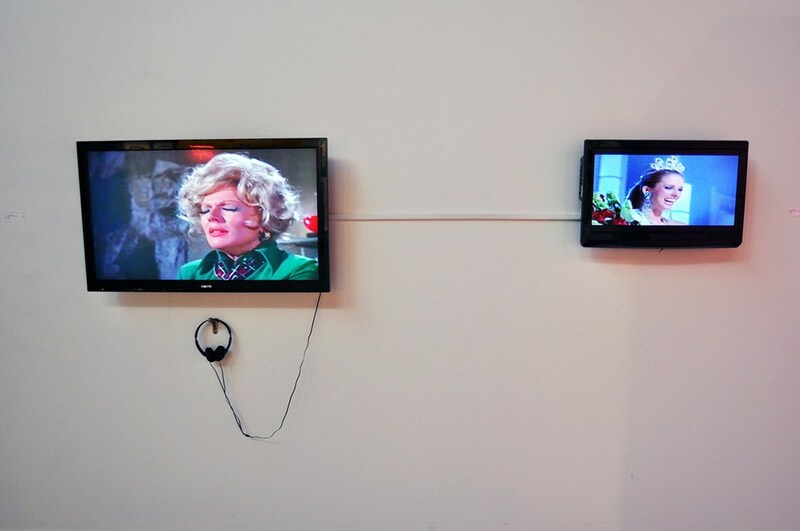 These images evoke certain cinematic expressions and allegories that imply a culture of fear while paradoxically indulging romantic notions of gender empowerment, violence, and equalization, and invite the audience to consider how these images play into postmodern notions of gender identity and feminist theory. In this Anthropocene epoch where humans and their juggernaut of capital have radically affected earth’s systems, Tiamat, the goddess, has revived to avenge herself. The new myth, The Glamorgeddon, is the story of the chthonic goddess’ rage and resistance to extraction, commodification and degradation. The Mystery origin of Babylonian is, at simplest, a battle between the goddess Tiamat and god Marduke. Marduke kills Tiamat, the monster of watery chaos. Her chopped-up body becomes our cosmos. In this era of renewed battle among humans for the earth and her bounty, we desperately need the mythopoesis of mystery again. What are the mysteries, the deep secrets that might help us save each other? We will consider other mysteries, sigils and alchemies of imaginative restoration and resistance. This interactive lecture will examine the shift in anatomical desire and the rise of the “booty” with analysis of popular music videos, racialized bodies and historical references to early figures such as the Hottentot Venus, South African women presented as a circus sideshow. Participants will be engaged in discussions of feminism and hyper sexuality in the media. Dr Mesa-Bains will be accompanied by Professor Angelica Muro, a specialist in media analysis. Manananggoogle’s mission is to organize the world and make it universally accessible and useful. 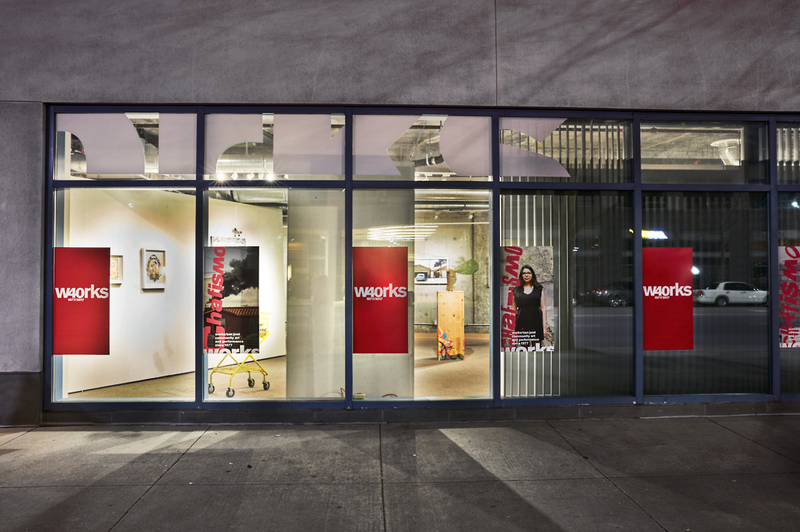 With offices all around the globe, its headquarters remain in Mountain View, California. Certain circles in Silicon Valley have not taken kindly to this powerful company’s formidable influence, and nervous whispers abound: Manananggoogle’s 3 founders and chief executive officers are even rumored to in fact be the legendary, mythical Philippine manananggal–– bloodthirsty, vampire-like creatures. Manananggoogle’s Limo Lecture promises to inspire you to new heights of corporate achievement, and/or new lows of abject terror. Dress to impress. Diapers potentially necessary. Artist Jaime Cortez and Professor Marcia Ochoa of UC Santa Cruz will elaborate on ideas put forth in Ochoa’s adventuresome new book “Queen For a Day: Transformistas, Beauty Queens, and the Performance of Femininity in Venezuela.” Beauty pageants play an outsized role in Venezuela. The country has won more international beauty contests than any other. Come explore the connections between national femininity and modernity. Cortez and Ochoa will draw parallels between Venezuela’s world-class beauty queen culture and the culture of transgendered women, who make the streets of Caracas site for work and a place to inject fabulosity into the urban imaginary. L.M. 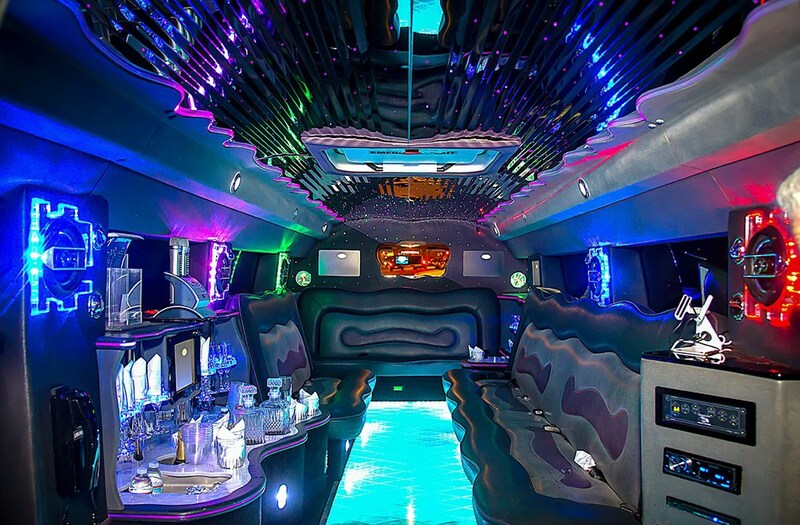 Bogad will guide all intrepid Limo-nauts on a DRIVE-BY AUCTION of cosmic proportions throughout San Francisco. Be prepared to bid! And to sell! This auction within a lecture within a game will ask: what are you in the market for?